I believe Colonel Mustard did it, in a dining room with a gun. This entry was posted in Gallery and tagged 365, 365 Project, board game, clue, Colonel Mustard, d7000, dining room, fact, fun, gun, History, I Don't Have A Clue, night, Nikon, Photo, Photography. Bookmark the permalink. Thank you for sharing this! When I was a kid *cough, cough, a long time ago* I totally wore this game out! Great memories! 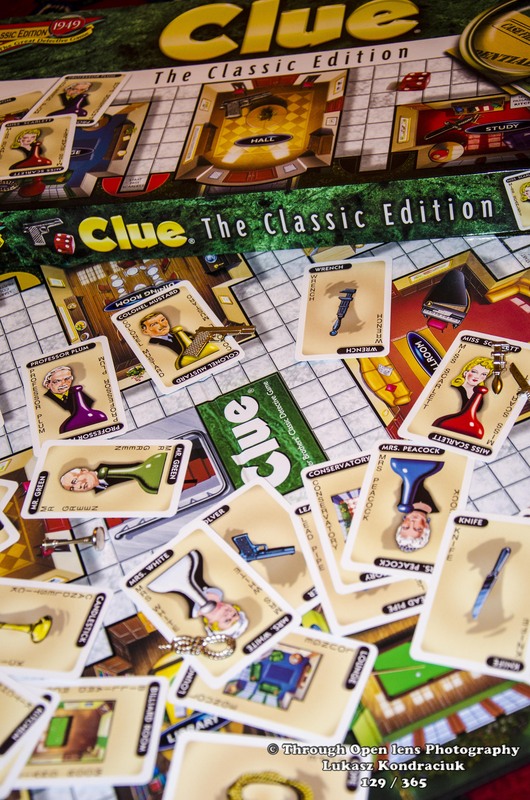 I invented a “Clue for 2” variant (for those times when you can only get two players) a few years ago, but no one was interested. One of my favorite game growing up! I remember I always wanted to be Miss Scarlett. I didn’t realize how long it had been around though. Love the title with the picture. And brings back so many childhood memories! I agree with @4wallsnaroof => had no idea the history. Thanks!